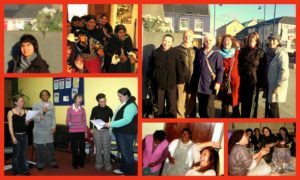 Global Harmonies can provide once-off or regular singing and voice workshops promoting confidence, wellbeing and social inclusion. Global Harmonies has been running singing and voice workshops with diverse groups in the community since 1997. These sessions differ from traditional choirs and singing classes as there is a strong emphasis on inclusion and promoting well-being rather than on performance, perfection or producing a particular type of sound. Each participant is equally valued regardless of talent, gender, age, disability, sexual orientation, special needs or ethnicity. A nurturing and safe space is always created so that participants can enjoy the amazing benefits of using their voices and let go of worries around being good enough. Singing in groups is now proven to have myriad physical and emotional health benefits. Singing boosts the immune system and produces endorphins which alleviate stress, depression and anxiety. It also enhances feelings of trust and bonding even amongst strangers, due to another hormone released during singing, oxytocin, (known as the human love hormone). Everyone can do it, and most people long to do it, even if they are not ‘good singers’. Singing and music is an integral part of our cultural identity and it also allows us to transcend these, and to experience something deeper still, a space beyond labels. Depending on the participants needs, sessions can involve breathing exercises, bodywork (stretches, yoga and tai chi exercises to complement singing), vocal games and warm-ups, simple chants and songs from around the world, learning about diverse culture, toning (singing vowel sounds for extended periods), chanting (combining the benefits of singing and meditation by repeating simple sung phrases), improvisation, sound healing exercises (balancing energies of the body through voice), reflection and group discussion and sometimes sharing songs and stories. A once-off workshop (up to 2 hours) or course (e.g. 1.5 hours per week for 6 weeks) for between 8 and 30 people. Features vocal exercises and practices as well as uplifting harmony songs and chants. Also includes movement, guided relaxation and stillness and discussion on how to harness the benefits of singing for looking after our mental health and relieving stress, anxiety and depression. Entails vocal exercises and exploring simple songs and chants from around the world. The emphasis is on finding your voice and having an uplifting and stress relieving experience together. Suits a diverse cultural/ethnic or linguistic background group and is particularly designed to focus on enhancing bonding as a group while experiencing various cultures through their music. · Especially designed for culturally diverse groups of all ages and abilities. · Ideal for intercultural festivals and arts events. A once-off workshop for children, involving a magical imaginary boat journey around the world encountering diverse cultures through their music. Simple songs are taught and unusual instruments are introduced to the enthralled children! · Designed for children aged 6-12 years. · Usually involves 2 facilitators. This is a workshop especially for elders, parents and small babies. Grandparents and parents can bond while they sing simple harmony songs and lullabies to soothe the babies who can be held or lie on the floor. A great stress reliever for those minding small babies, and way to socialise with others. · Parents or carers, grandparents or older people and small babies (under 12 months). In this workshop we explore the powerful role music and singing has played in promoting social and political change around the world. We try out some vocal exercises designed to free the voice and then listen to and try out some songs and chants from around the world. The workshop can include participants writing some original chants about the issues that concern them. · Adults of all ages and abilities. Rachel Dempsey has been running Global Harmonies singing and voice workshops since 1997. Through this she has worked with a huge variety of groups including women’s groups, mental health organisations, migrant organisations, corporate sector, community development organisations and more. Graduate of Latin American Studies (BA) and Ethnomusicology (MA), she has had a life-long passion for learning about the transformative powers of music around the world. Rachel has lived and travelled all over the world researching and facilitating singing and music (France, UK, Colombia, Brazil, Mexico, Bolivia, Mali and Australia). She also trained in ‘Music and Sound in Personal Development and Healing’ with music therapist Daniel Perret from 2008-2010 and is currently training in ‘Capacitar’, which is a hands-on popular education approach to teaching simple wellness practices that lead to healing, wholeness and peace in the individual and in the world. She also has a background in working in development education, community development and working with various migrant organisations in the UK & Ireland. Rachel is an experienced, intuitive, adaptable and sensitive group facilitator with the ability to work effectively with diverse groups. She also has experience as a lead singer in Dublin based Latin band Candela as well as running her own vocal performance groups. Please contact Rachel at [email protected] or 086 309 7232 to discuss. “I felt that bringing all of the participants together through the sound and voice workshops would help unite and further break down barriers between women who perhaps did not know one another/come from various cultural/ethnic/socio-economic backgrounds. Thus, it was a way of achieving a profound level of participation in the event”. Organiser International Women’s Day Celebration, Southend Family Resource Centre.